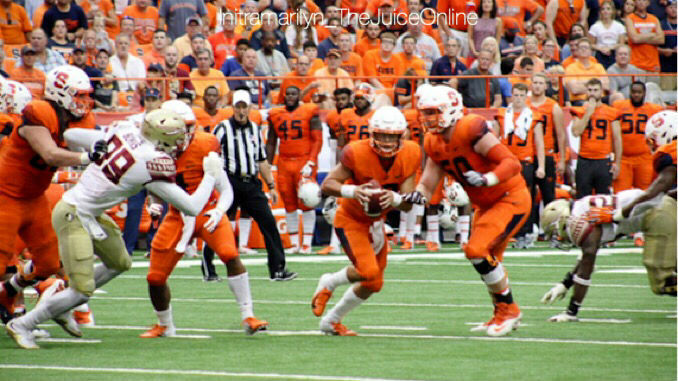 Tommy DeVito looks to throw in the second half of Syracuse's 30-7 win over Florida State. Mandatory Photo Credit: Initra Marilyn, The Juice Online. Item: Over 4,000 new season tickets sold for 2019 Syracuse football announced on April 1? No Fooling (pun intended). Or at least what resembles a football school these days as college football heads into its 150th anniversary season in 2019. That’s a Power 5 conference program competing for a conference title and playing, and winning an annual New Year’s Day or better bowl game against strong competition. Now Orange Nation is speaking loudest. In near record numbers fans are disposing of hard-earned dollars to root on the ‘Cuse following Dino Babers much ballyhooed breakout 10-3 season, including giving Clemson its biggest scare in an eventual undefeated national title-winning season. The university announced Monday that over 4,000 season tickets have been sold for the upcoming six home game portion of the schedule, ranking as one of the largest one season increases in the Dome era (1980-present). Oh, and get this, Syracuse season tickets for six games, including Clemson, start at $125. The average ticket to one Buffalo Bills home game last season was $70. In fact, the first and second level season ticket allotment for the building is down to under 1,250 tickets. That growth, combined with a traveling contingent rooting on their beloved Tigers, will ensure a sellout crowd baking in the Dome’s sauna-like conditions when nearly 50,000 people are in the building to welcome Clemson on Sept. 14. Add the fact that over 90 percent of current ticket holders are renewing their plans, and it’s clear to see the job Babers has accomplished since his turn at the pulpit during his introductory press conference only 16 months ago.